Rubén and I are related distantly on my Dad's side. Our family hails from Arecibo. Many moved to the US during the great waves of migration but, some of us remained in Puerto Rico. Rubén remembers leaving on a plane for Florida when he was very young and arriving in a swampy area of Miami that received an influx of immigrants from neighboring islands. It's hard not to smile as he shares his story through the mind of a six year old: My mother dressed me in my best suit. No one showered on that plane. It smelled to high heaven. One of the first meals I ate in the U.S. was a 'hot dog'. I thought, do these people in the states eat dogs? He lived for many years in El Barrio, in the same areas around Lexington where my father grew up. But, hardships and homesickness led him to return back to Puerto Rico as a young adult. He has lived in Bayamón ever since, where he married and raised his family. I went to visit Rubén on Father's Day. He took me through the neighborhood, several months after the storm. Insurance companies hadn't addressed many houses that were damaged and electrical lines were still down in the streets where people walk. Flat tires are a monthly occurrence as roads remain unfixed and are filled temporarily. 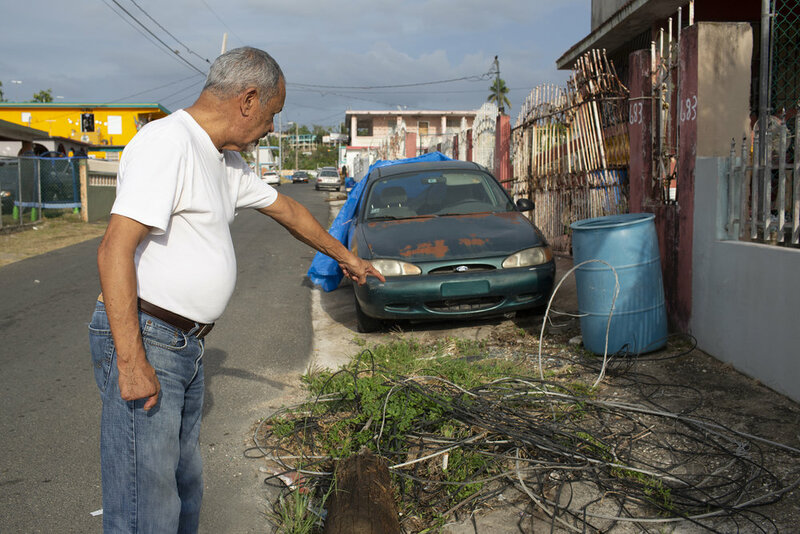 He informs me of the politics on the island and the crumbling infrastructure that began decades before Maria in the form of rigged local elections and empty promises from political parties that never delivered. His daughters have a grace and sense of humor about all of it— qualities that they've refined after living through this disappointment their whole lives. Mayra works in a restaurant and Amanda just began working with FEMA. Single mothers, they are a close pair that have raised their own children, put them through private school and prepared them for university. Mayra gives me a tour of her backyard garden where she shares some recao seeds with me. Both of them have the "jibara thumb" and try to grow their own veggies and herbs as the weather and their schedules allow. Over dinner, we talked about job opportunities they looked into in the states in between bitefulls of crispy chicharrón. A few hours into dinner, the electricity goes out. This is a regular occurrence they greet with cheers—as if they just heard their favorite song at a club. Ready with emergency lamps and candles from their pantry, they light some around the table and the rest of our visit feels like we are on a family camping trip; jokes and stories as shadows dance across the walls.